TimeForge can integrate with many different software programs, including accounting systems such as QuickBooks. QuickBooks is one of the most popular accounting systems in the world, and is used by small, medium, and large businesses around the globe. 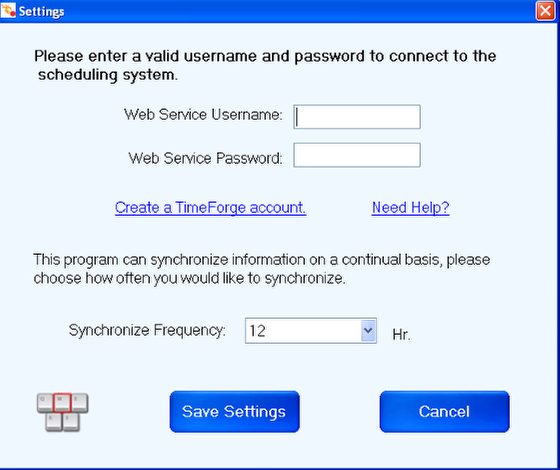 TimeForge integration with QuickBooks involves installing the TimeForge Accounting Bridge software on one of the computer systems running QuickBooks. If you are using QuickBooks Enterprise, you can install the software on the QuickBooks Enterprise server. 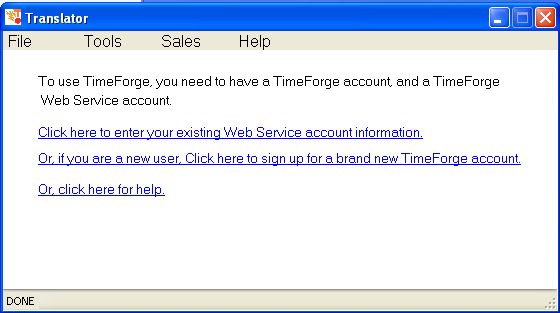 If the TimeForge Accounting Bridge was not properly configured to use a Web Service account, you will first need to configure the Web Services. If the TimeForge Accounting Bridge has not yet been fully configured, make sure to set up the Web Service Username and Password. These values can be configured on the TimeForge web site, and will allow the software to communicate with TimeForge securely. Review the TimeForge Accounting Bridge dashboard. 1. Click on this link to set up the type of QuickBooks payroll that is imported. TimeForge will import all payroll hours (time sheets) as a single type of pay, for example, as “Regular Pay” or “Hourly Rate”. If you would like to split the time into multiple payroll types, this will need to be done inside of QuickBooks. 2. If a QuickBooks file is currently open, the company file will be displayed. 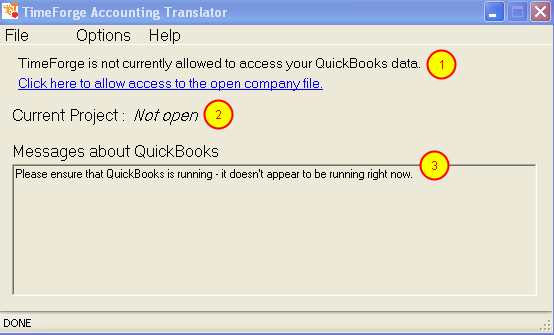 In this example, no QuickBooks company file is open. 3. A status message about QuickBooks will be displayed. In this example, QuickBooks does not appear to be running. You are all done! You can start using TimeForge and QuickBooks to process your payroll.